Natural Remedies and Causes of Droopy Eyelids (Ptosis)? Droopy eyelids, or ptosis, is a condition characterized by the sagging of the upper eyelid. The condition is also called blepharoptosis, and there are several names for the various ways it can affect you. For example, a single droopy eyelid is known as unilateral ptosis; when both eyes are affected, it’s called bilateral ptosis. When there is excess baggy skin in the upper part of the eyelid, it’s known as dermatochalasis. Droopy eyelids can also be present at birth, in which case the condition is called congenital ptosis. And when droopy eyelids develop later in life, it’s known as acquired ptosis. Ptosis can be temporary or permanent. There are several possible droopy eyelid causes. You may suspect that the cause of droopy eyelids are allergies, but true eyelid ptosis is not related to an allergy. The causes of ptosis can stem from something benign, but they can also develop from something more serious. A number of factors can affect the nerves, skin, or muscles of the eyelids and can lead to ptosis. What Are the Symptoms of Droopy Eyelids? Drooping or sagging eyelids can reduce your vision, but it depends how much of the pupil is obstructed; the eyelid may only droop slightly or it may cover the entire pupil. Absent or uneven eyelid creases. Children may also develop certain body positions or gestures which can be a sign of problems with their vision. For example, they may tilt their heads back or raise their eyebrows in order to see. How Are Droopy Eyelids Diagnosed? First, it’s very important that children or adults with ptosis have regular eye exams. A basic vision test with an eye chart or a slit-lamp exam can help determine the severity of ptosis. In the diagnosis of droopy eyelids, there will be a comprehensive intake and a physical examination to reveal your symptoms and medical history. However, the doctor may also use blood tests to help determine if the underlying cause of droopy eyelids is something like diabetes or an autoimmune disorder. It may also be necessary to get an X-ray if structural abnormalities around the eye are suspected to be the cause of the issue. Another drooping eyelid exam is called the Tensilon test. This is where the doctor injects a patient with a drug called Tensilon, and the patient may then be asked to move their eye muscles to see if the drug improves muscle strength—this helps determine whether muscle issues are causing the droopy eyelids. A tension test may also be given if myasthenia gravis is thought to be the cause of the problem. When ptosis symptoms are mild, treatment is likely not needed. In general, the best treatment for droopy eyelids will depend on the exact cause. For example, your doctor may prescribe wearing special glasses to fix an uneven cornea curve that causes blurry vision (astigmatism). These glasses feature a crutch that holds up the eyelid. Wearing an eye patch may strengthen the vision in your weaker eye. In moderate to severe cases, surgery for droopy eyelids may be recommended. Levator aponeurosis advancement is the most common type of surgery for ptosis, where the surgeon will lift the eyelid and tighten up the levator tendon. On occasion, the levator is too weak to open the eyelid, and therefore a sling is used to allow the forehead muscles to lift the eyelid. Most people will heal within six weeks after droopy eyelid surgery, but swelling and bruising will often last for two to three weeks. Although surgery is the most efficient way to correct ptosis, there are also certain droopy eyelid remedies that may also help. 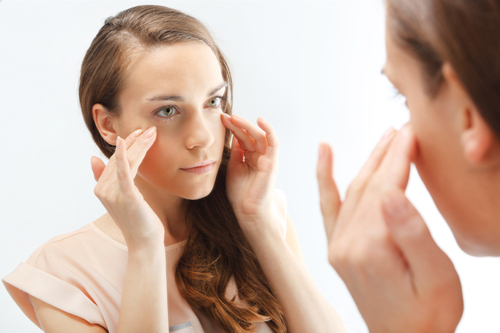 Here are some natural treatments and remedies for people with ptosis. Chamomile contains anti-inflammatory properties that are perfect for the nervous system. Drinking chamomile tea may help your eyelid relax, but you can also use chamomile tea bags topically on your eyes to treat ptosis. It’s best to store wet chamomile tea bags in the refrigerator overnight before placing them on your eyes in the morning. Keep them on your eyelids for 20 minutes at a time to relieve sagging eyelids. Bell’s palsy can cause ptosis, and often doctors will recommend certain nutrients for the condition such as vitamin B12. Overall, B vitamins are useful for the entire nervous system; vitamin B2 is also known to protect against vision problems and eye fatigue. Other nutrients important for the nervous system and eye health include calcium, magnesium, zinc, vitamin C, vitamin E, taurine, lecithin, and essential fatty acids. Certain herbal remedies can also help treat droopy eyes. For instance, a comfrey or plantain cream can help to strengthen weak connective tissues. Shave grass may also be used to strengthen connective tissue integrity of the eyelid, while cramp bark helps to strengthen the muscles of the eyelid. Homeopathy is considered an effective therapy for those with eye inflammation or swelling. As mentioned, a stye is a potential cause of ptosis. A stye is small, pus-filled boil found at the base of the eyelid. Stye symptoms include tearing, eye pain, and eyelid swelling. Some remedies used for styes and eye inflammation include pulsatilla, staphysagria, and hepar sulphuris. Other homeopathic remedies for droopy eyelids include alumina, belladonna, causticum, cocculus, conium, dulcamara, gelsemium, kali carbonicum, nitric acid, opium, rhus toxicodendron, plumbum metallicum, sepia, spigelia, stannum metallicum, and zincum metallicum. Another natural way to relieve droopy eyelids is through exercise. The eyelids are part of a muscle ring around the eye called the orbicularis oculi. There are several eye exercises for droopy eyelids that can tone your eyelid muscles. If you have droopy eyelids, here are some good exercises you can try. One-eye exercise: It’s a good idea to perform an exercise that targets the affected eyelid and its muscles. This will help to build tolerance of the eyelid muscles and improve ptosis. For this exercise, move your eye in a figure-eight movement for a few minutes every hour or so. Lower eyelid squints: Eyelid exercises in which you squint with your lower eyelids are thought to decrease puffiness beneath the eyes. Begin this exercise by lying supine or sitting erect. Next, put your index fingers at the outer corner of your eyes, and place your middle fingers on the inner corners of the eyes. Gently apply pressure, look to the ceiling, and squint strongly with the lower eyelids. Keep your upper eyelids open, and release the squint. Repeat this 10 times. Upper eyelid stretches: This is a good exercise to strengthen your upper eyelids. Look directly in the mirror and place your index fingers just under the eyebrows with your fingers slightly curved. Next, hold your eyebrows against the bone above your eyes. Close your eyes, and stretch your upper eyelids down. Repeat this movement five times, and then squeeze your eyes shut for six seconds. Relax your eyelids for three seconds and then open your eyes. Do this exercise twice a day for at least five days a week. Patch exercise: You can also improve ptosis with an eye patch. This forces your affected eye to perform all the work when it comes to vision, and increases your focus and the movement of the eyelid muscle. You can do the patch exercise by covering your healthy eye with gauze or a patch. Consult your doctor for advice on this exercise first, though—they may recommend you perform the patch exercise for a lengthy amount of time based on the severity of your ptosis. Yogic eye exercise: Although the yogic eye exercise is not directly for your droopy eyelid, it can improve the focus, concentration, and vision in your affected eye. Simply sit on the floor comfortably with your spine straight. Then, focus your eyes on a particular object and hold the gaze for a certain amount of time. You will feel your eyelid muscles work while holding your stare. Try focusing on a flame or an apple. If droopy eyelids are left untreated, the most common complication is a condition called amblyopia; you may know this better as lazy eye. Other ptosis complications may occur after droopy eyelid surgery. Smokers have an increased risk of surgical complications since they heal at a slower rate, and some surgeons may request that you quit smoking for several weeks before your surgery. An infection at the surgical site. There is not much that be done to completely prevent droopy eyelids from occurring, especially when the condition is hereditary, but a few simple lifestyle changes can help. Here are some things you can do that may help prevent sagging eyelids. Get frequent eye exams: Annual eye exams can help prevent eye drooping. Exercise on a regular basis: People with higher body mass indexes often have a higher percentage of fat. This can accumulate in the skin above the upper eyelid, causing it to droop. Avoid cigarette smoke: Smoking and secondhand cigarette smoke is the central factor associated with droopy eyes linked with aging. Ultraviolet ray protection: Wearing sunglasses can help protect the eyes against both ultraviolet A and ultraviolet B rays. Do you get sagging eyelids or droopy eyelids (ptosis) regularly? If so, seek your doctor’s advice immediately. Your doctor will help you determine the cause and severity of the problem, which will in turn help to decide the most appropriate treatment and whether or not surgery is necessary. If one eyelid suddenly droops or closes shut. Roth, A., “Ptosis/Drooping Eyelid: A Guide to Ptosis,” Eye Health Web web site; http://www.eyehealthweb.com/ptosis/, last accessed April 1, 2016. Thompson, S., “Eye Exercises to Decrease Ptosis,” Livestrong web site, August 16, 2013; http://www.livestrong.com/article/324870-eye-exercises-to-decrease-ptosis/, last accessed April 1, 2016. Tang, K., “Eyelid Sagging Exercises,” Livestrong web site, April 16, 2015; http://www.livestrong.com/article/206354-eyelid-sagging-exercises/, last accessed April 1, 2016. “Ptosis-Falling Eyelids Natural Remedies,” Dave’s Healing Notes web site; http://www.daveshealingnotes.com/ailments/ptosis-falling-eyelids-natural-remedies.html, last accessed April 1, 2016. “Eyelid Drooping (Ptosis),” Healthline website, Oct. 5, 2015; http://www.healthline.com/health/eyelid-drooping#Overview1, last accessed April 1, 2016. “Eyelid drooping,” Medline Plus web site, last updated March 2, 2016; https://www.nlm.nih.gov/medlineplus/ency/article/001018.htm, last accessed April 1, 2016. “Ptosis-infants and children,” Medline Plus web site, last updated March 2, 2016; https://www.nlm.nih.gov/medlineplus/ency/article/003035.htm, last accessed April 1, 2016.